"For a title to make it into these pages, it needed to have rousing food and drink scenes." It’s not enough for me to just enjoy classic movies. I incorporate them into my every day life. For me, being a lover of classic film is not a hobby. It’s a lifestyle. 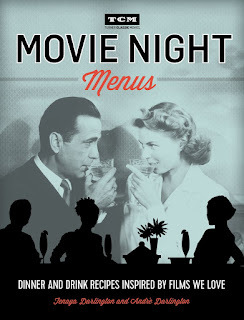 This is why I’m glad the brother-sister team Tenaya and Andre Darlington have released their newest collaboration: Movie Night Menus: Dinner and Drink Recipes Inspired by Films We Love. As someone who loves to cook and enjoys a great cocktail, the idea of pairing both of these things with classic films was just a recipe for success. Once I heard about Movie Night Menus I knew I had to get my hands on a copy. It’s published by Running Press who partners with Turner Classic Movies on a dedicated imprint of books for classic film enthusiasts and newcomers alike. The Darlingtons are experienced food writers with sophisticated tastes for food, cocktails and entertaining. Inspired by the movies and their love for fine dining, they built menus around 30 different classic films ranging from 1930 to 1987. Each film is spotlighted with an introduction that gives some background on the film, helpful for those who haven't watched it yet, as well as movie quotes and promotional stills. Every movie gets one cocktail and one or two food recipes. Some of the menus are full meals and others are meant for grazing throughout the movie. The recipes are inspired by food and drink featured in the film but also by other factors including style, era and setting. In addition to the recipes there are trivia bits and advice on how to decorate or set the table for entertaining. The writing in this book is as delicious as the food. I even enjoyed reading the recipes and picked up a few tricks. Some of the recipes serve double duty and can be made for more than one film. The authors are very particular not only about ingredients, especially with the cocktails, but method as well. I cook a lot and can appreciate how good technique enhances the quality of the final product. 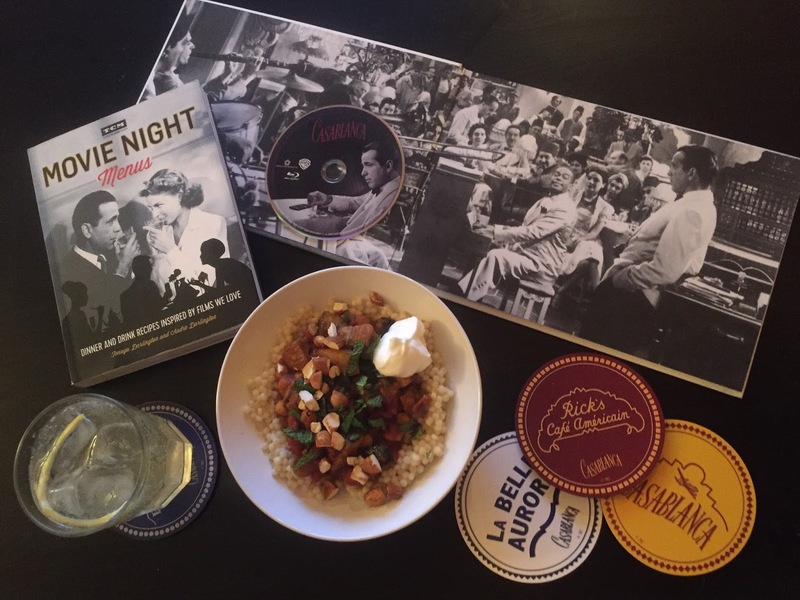 I've already made a few drinks from the book and last night I made the meal assigned to Casablanca (1942). See below. 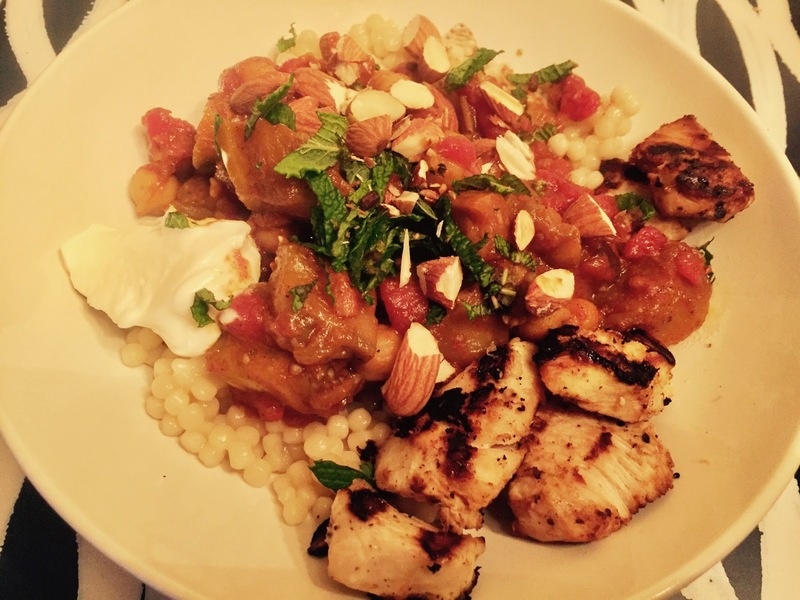 It consisted of Roasted Eggplant Tagine, a Moroccan dish, and a French 75, a gin and champagne cocktail. I added some grilled yogurt marinated chicken for some protein, plated it up, built the cocktails and we sat down to watch Casablanca. The meal was divine and I discovered a favorite new cocktail. My only quibble was that the recipe never called for roasted the eggplant. Carlos hates eggplant but ate the meal with much gusto. We clinked our highball glasses when Paul Henreid heads to the bar to order a champagne cocktail. It was so much fun to build a meal around a film. In my previous attempts I made meals exactly how they were depicted on screen. I made complete dinners for They Died With Their Boots On (1941) and Fortune Cookie (1966). Sometimes older recipes or food choices lend themselves to contemporary palates. The Darlingtons adapted several drinks and dishes for more modern tastes and use substitutes when certain liquors are no longer on the market. There are so many recipes I want to try and only a few I'll skip. I'm not sure why but in the 1930s they really loved adding raw eggs to cocktails. Besides the occasional Pisco Sour, these are a pass for me. I really adored the pastry and fun ice cream champagne cocktail assigned to Breakfast at Tiffany's (1960). And I love how the authors had fun with films like Rope (1948) which includes recipes for Parmigiano Rope Twists, Camembert in a Coffin and the Art of a Choke, a cocktail made with an artichoke digestif. Other movies include: The Divorcee (1930), Grand Hotel (1932), Female (1933), The Thin Man (1934), The Philadelphia Story (1940), Adam's Rib (1950), Giant (1956), The Apartment (1960), Dr. No (1962), The Graduate (1967), The Sting (1973), and so on ending with Moonstruck (1987). I wish every recipe came with a photo but alas it wasn't the case. Fair warning to those of you who don't drink, this book is heavy on the booze. I much prefer cocktails to wine or beer so this was perfect for me. The entertaining tips were fun to read but I'm not sure if I'll actually put them into practice. Knowledgeable classic film buffs will pretty much know everything that's included in the intro and trivia bits which are more for newcomers. This is such a fun book to read. Don't give in to the urge to just flip through to look at the pictures. Savor each and every page. Tonight TCM will be airing some of the movies featured in the book and the authors will be taking over TCM's twitter during the marathon. 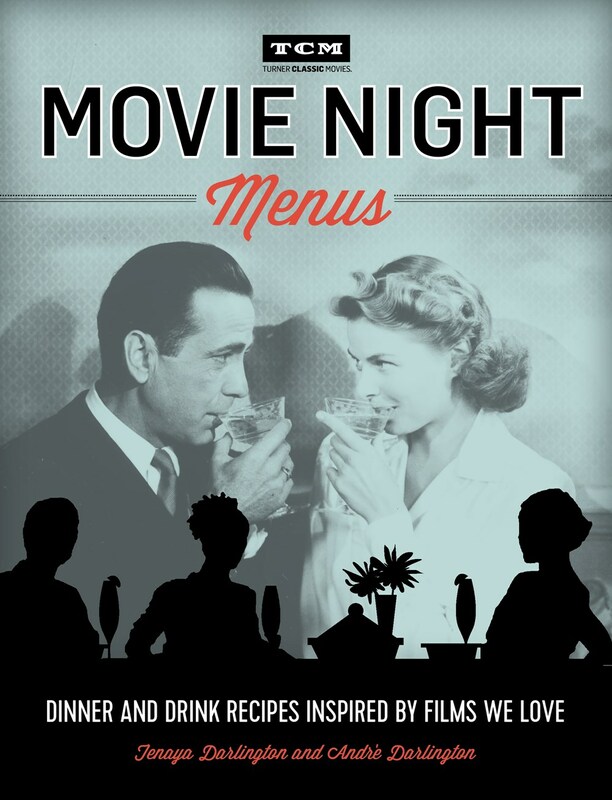 If you're a classic movie fan with fine taste in food and an appreciation for a good cocktail, Movie Night Menus is a must-read. Thank you to Running Press for sending me a copy of this book to review!